Your baby will be moving a lot more at 6 months. She will start to sit with minimal support. 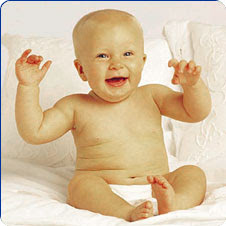 Most babies can now roll from back to front and front to back at the same time. Since they are starting to be mobile at this ]time , I tell parents to start childproofing the house. Make sure they have the POISON CONTROL (1-800-222-1222) number at a visible location. She will start to transfer objects from hand to hand. Turns to sounds and you will hear babbling with somewhat different intonations. At this age, she can definitely communicate if she likes or dislikes something. I usually tell the parents to advance her diet as tolerated. Prevention is the key to avoid a lot of accidents at this age. We do not recommend walkers because the baby is more mobile than they can handle. They tend to grab onto things which falls on them. They can fall onto the staircase. As long as we can prevent this things from happening enjoy your 6 month old.